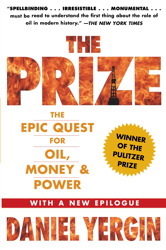 Today I finish reading the book The Prize - The epic quest for oil, money & power (Daniel Yergin, 2010, 908 pages). I can just feel a great pleasure after completing this fantastic journey through the world of the oil and gas, since its beginning as a modern industry, on the mid-1800’s, to the recent days. To talk about oil and gas is to talk about economics, politics, diplomacy and war, for this energy-supplier was at the center of virtually all big events of the last 150 years. Especially interesting, for example, was to follow how gasoline, for tanks, ships and airplanes, dictated most of the important decisions taken by the powers fighting the World War II. And oil is one of these things that is easy to grasp the importance of, since it makes not only the headlines in the papers so often, but also plays a very noticeable role in our daily lives, particularly after the beginning of the automobile industry. For these reasons above and many more, I strongly recommend this book. The overall discovery on the oil's history is also a great way of building a rich contextualization over the world’s history (mainly American, European and Asian history), which is amazing for all those interested in the past and its role in shaping the present and future. Finally, I would like to thank the author, Daniel Yergin, for this great piece of work. It is impressive to see a book with so great ambition of scope, and such fantastic qualities of good and sober analysis, combined in an attractive writing style that make the text, though long, very delightful to read.